Important: Before making any changes to your system, you should backup all your important data. Start Windows XP, install and launch VistaBootPro. Go to Manage OS Entries and then select the Microsoft Windows Vista entry. 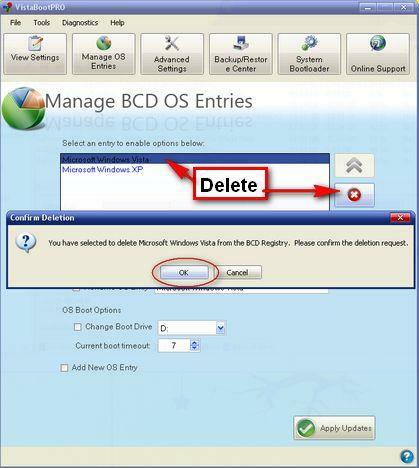 Click on the Delete button and confirm that you want to delete Windows Vista from the BCD Registry. Now you can close VistaBootPro. 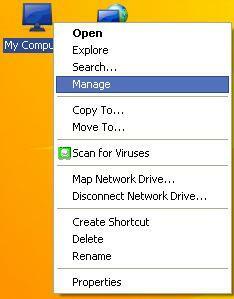 Go to your desktop, right click on My Computer and select Manage. In the Format window you can type the new name you want to set for this partition. Also you can change other settings such as the file system or the allocation unit size. We recommend you to use the default settings for both and press the OK button. In case you don't want to wait for too long, you can always perform a quick format. Just check the Perform a quick format box and press OK.
You will receive a warning. Click on OK and the formatting will begin. The formatting process can take from a few seconds up to several minutes. The duration depends a lot on the size of the partition and the type of formatting (normal or quick format). When finished, you will no longer have Windows Vista installed on your system. Thanks for putting this on your webiste. There are a few of us that like the look of Vista, but sadly, it doesn't meet our needs; us gamers. We recently 'won' a new laptop which came installed with vista. We would like to uninstall vista and install Windows XP. How would I proceed? Hi, my computer came with win vista.. and i want to go back to XP..
but the problem si that win vista is installed ind the same parition that all the rest of the information... it has inly one partition.. what can i do? First, create another partition using the available free space, move your data to the other partition and then install Windows XP. hey, please help with this - my com was previously running on XP, but after it crashed i used a XP CD to recover it, but now it's demanding a product key which i don't have and i want to restore my previous XP version. however, i can't seem to partition C and D drives - it says it contains system files and can't be extended/formatted. The product key of XP can be found on a sticker on your computer or on the anvelope of the CD or the recover CD. You can use this tool to find the XP product key you had on your cumputer before the crash: Product Key finder. You can't format C or D because Windows installed system files on those partitions. You need to insert the WinXP CD and format the desired partition from the setup process. I installed Vista on XP as dual boot on the another partition. When I uninstalled Vista and installed it again it collected some old information so it means that something is left over on C: where I have XP installation but cannot figure out what it is. I deleted Boot.BAK and Bootsect.BAK from C: but something else is left on C: drive. I also formated D: partition where I have Vista installed. Any clue? don't worry, if you have formatted the partition where Vista was installed and you have removed the Vista bootloader, there are no other significant (vista) files on your system. I installed Vista on XP as dual boot on the another partition. how can i uninstall Windows Vista without delete or format my partion? I have importan files and i can not lose them. Move your important files, then format the Windows Vista partition and use VistaBootPro to edit your boot entries. I am having difficulty in e-mailing Microsoft for support. My ID Product key says that it's not in use with this language. I tried using all of the countries and it still says the same thing. I rang Microsoft and they gave me a new ID Key that never worked either. I was told I would need to format the PC. I just formatted it and it still does the same thing. What can I do? I was dual booting vista ultimate with xp pro and i'm trying to get rid of vista. Both are on a seperate of my two partitions. I'm trying to format the partition that vista is on but i get an error right at the end that says "windows is unable to complete the format" I really don't know what to do. At the last step at disk management, I am unable to select the format option. Any idea why could this be so? Thank you. I bought a tosiba sattilite yesterday, same old stuff as above. I would keep it but I have no power over my own files. in other words, I have been denied in some folders, when I am the admin, yes I know about the virtual folders and "NOOOOOO" wrong answer. I want complete control over my pc, I want to know whats going in and out. So. whats my question. In explorer of vista home, I CANNOT access the documents and settings folder. The pc saids I do have admin rights but "nooooo" vista will not allow me in. What is ms hiding, way would they do this??? Next, I cannot control my privileges, as I do in xp. If anybody can help, this would be cool. Maybe I just have the new os blues and do not how to maneuver, if so, please please please help me. Read this tutorial. It might help you! I wanted to remove vista to install XP. So i booted from an XP cd and when the blue screen comes where you can either hit enter to install or R to repair or F3 to quit, no matter what i type, the next screen always tells me that the installation (or repair) progress can not be continued because it didn't recognize any hard drives ( although i got a 160 g hard drive split into 2 partition), it doesn't find any of them and leaves me with the only option to hit F3, telling i should verify that my hard drives are well connected. Any suggestions? I haven't heard of anyone having had this problem yet! Try to set one of those partitions as active. It should work. i cant uninstall vista is the file i format fat32? 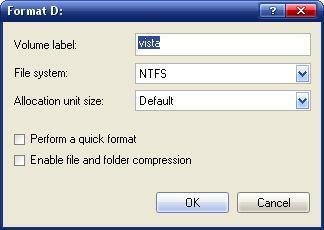 It is best to install Vista on a NTFS partition, not FAT32. Uninstalled and Quick Formatted disk C according to your tutorial. Now I want to clean install XP on disk C, while anothe copy of XP already exists on disk D.
Is it possible ? What about the creation of boot loader. It is possible, simply install another copy of WinXP on the C drive. After installation you will have 2 WinXP, and you can choose between them. If you want to edit the bootloader in XP, type in RUN the term "msconfig" and then go to the Boot tab. There you can customize a little the bootloader (edit the name, number of seconds, etc. ).